Paul had significant concern for those Thessalonian believers. They were being deceived through false teaching. When he wrote the second letter to them he urged that they not be taken in by speculations whether through prophecy, report or letter (II Thessalonians 2:2), or in any way. Prevarication created confusion within those converts which necessitated a detailed response from Paul. He was able to introduce important eschatological truths that resolved much anguish for those believers. That information has become, in turn, pertinent to us since it summons a deeper investigation into that Pauline message. The Apostle Paul first cautioned: “Don’t let anyone deceive you” (II Thessalonians 3:2a – NIV). That is also what Christ warned against before He gave the Olivet discourse regarding the end of time (Matthew 24:3). He repeatedly exhorted believers to beware of “false christs” and “false prophets” (Matthew 24:5, 11, 23-26). There would come teachers who were not loyal to Biblical truths. The “falling away” or apostasia (G) is rebellion or apostasy, suggesting a deliberate abandonment of a former professed position, contextually within the Christian community. The Thessalonians were led to believe that the Second Coming of the Messiah and the Resurrection had already occurred. Paul, addressing those two events, made it clear that they are still to be anticipated. There are many pointed signs and events which truly announce the expected coming of Jesus. They are to be known and understood. That links with Christ’s words: “When ye therefore shall see …” (Matthew 24:15a). The issue of apostasy or falling away joins that list. It is a sign! It is the purpose of this document to penetrate deeper into the apocalyptic issues of rebellion. Riveting are the many prophecies predicting major apostasy. It has been prophesied that broad ungodliness will infiltrate the very fabric of the church at the end of time: “This know also, that in the last days perilous times shall come…. Having a form of godliness, but denying the power thereof: from such turn away” (II Timothy 3:1-6). The second letter to the Thessalonians is a helpful springboard toward a deeper understanding of that ungodly, perilous time. As noted above, “falling away” comes from the Greek word apostasia – but it is preceded by an article – “the apostasy.” This article points out something that appears to be well known. It suggests an anaphoric tone: “Surely you recall what that truth was!” (II Thessalonians 2:5). The issue contextually relates to a previously affirmed truth that the lawless person will undermine. The lawless one will come with “deceivableness of unrighteousness” (II Thessalonians 2:10), echoing Daniel’s description of the little horn (Daniel 8:23-25). Its followers do not love truth (II Thessalonians 2:10), recalling again Daniel’s description that antichrist, with his followers, “cast truth to the ground” (Daniel 8:12). He takes God’s place in the Church (II Thessalonians 2:4), which reverberates with: He “shall pollute the sanctuary of strength” and “the place of his sanctuary was cast down” (Daniel 11:31, 8:11). This terrible rebellion is within God’s covenant community. It is consistent with the Danelic imagery of the last-day antichrist rebellion. It is consistent with the immediate context of a controlling deception within the church. Truth related to God’s righteousness and authority will be compromised. He will hate and forsake the holy covenant (vs 30). He sets up an abomination – something God detests (vs 31). He will corrupt by flatteries (vs 32). He exalts himself above every god (vs 36). Deception leads to that “departing” or “falling away” with the focused leadership of the antichrist. His followers facilitate that antagonism with actual hatred for truth (Daniel 8:12). “The Spirit clearly says that in later times some will abandon the faith and follow deceiving spirits and things taught by demons” (I Timothy 4:1). There will be individuals led by “spirits” not from heaven. “… not to become easily unsettled or alarmed by the teaching allegedly from us – whether by a prophecy or by word of mouth or by letter – asserting that the day of the Lord has already come” (II Thessalonians 2:2 – NIV) (some apparently fraudulently used Paul’s name). “So then, brothers and sisters, stand firm and hold fast to the teachings we passed on to you, whether by word of mouth or by letter” (vs 15). Don’t be caught up with such falsehood. Interestingly, disloyalty to God’s law is also implied because the antichrist will be law-less (vs 3 – NIV). Daniel especially helps us to see how this applies to the last days – our day. End-time defection will include much of Christendom. Paul’s Thessalonian counsel concerns things that immediately antedate the Second Coming. They’ve become an eschatological prophecy. Ezekiel 8 and its “abominations” (toeba – H) immediately preceding the sealing of God’s people (Ezekiel 9). Daniel 11 and 12: “Abomination” (shiqqus – H) that will lead to desolation. It is presented in the middle of the Olivet discourse. Ezekiel is transported to the north gate of the inner court of Solomon’s Temple. “North” symbolizes the “direction” or “location” where God’s throne exists (Psalm 48:2). An idol is blocking that entrance. It is in competition with the “northern entry point to,” symbolically, where the holy mountain of God (Ezekiel 28:14-16; cf. Revelation 14:1, Hebrews 12:22), Zion, where God resides. It was the direction toward which worshipers could envision God’s presence arriving from – His holy mount. This “direction” is where Lucifer used to serve and craves, once again, to appropriate. That satanic passion is unveiled: “How art thou fallen from heaven, O Lucifer, son of the morning! how art thou cut down to the ground, which didst weaken the nations! For thou hast said in thine heart, I will ascend into heaven, I will exalt my throne above the stars of God: I will sit also upon the mount of the congregation, in the sides of the north: I will ascend above the heights of the clouds; I will be like the most High” (Isaiah 14:12-14). In this imagery, the closest this fallen angel can come to realize that “dream” is to approach those precincts of the worship area designated for God’s chosen. “Jealousy” blocks the entrance to the inner court and to the temple where God wants to meet with His people. Intriguingly, “Babylon” is spoken of as also being “north” (Jeremiah 1:14-15; 6:1, 22). Interesting! Daniel depicts the apostate antichrist as the “king of the north” (Daniel 11:45). This “abomination” symbolizes anything that prevents God’s Spirit, His presence or His glory, to enter His church – the congregation’s hearts – their minds. In God’s eyes “jealously” can easily shut Him out! A covenant relationship issue is being violated. “You shall have no other gods before me” (Exodus 20:3-5, Deuteronomy 4:1-20, 5:7-12). The most “simplistic” idol can bar the all-powerful Creator God of the universe. God is developing a case against Judah – the remnant of His chosen! Ezekiel is being taken for a tour of their worship center. The evils are being choreographed in ascending horror. The prophet sees a “hole” in a wall he is to dig through. There he finds a door that enters into a dark room (apparently associated with the temple). Seventy men, representing the elders of Israel (the whole nation – Exodus 24:1, Numbers 11:16, 24:25) were worshiping a cross section of earthly creatures (from crawling critters to beasts). They were worshiping drawings of creations and not the living Creator Himself. These symbolized the diverse pagan gods that Israel had adopted. Each man had an incense censer, revealing active worship and prayers to these earthly creatures or to the gods they represented! This “worship” is being done in the dark with the assumption that God would not see (amazing, however – He is still recognized as existing!). This implies a rejection of Jehovah God and His omniscience (Isaiah 29:15). They also claim that He has forsaken the land – thus, a denial of His omnipresence. Intriguingly, Jaazaniah, apparently a civic secular leader, was in their center, suggesting he was their spiritual mentor. “The Bible says that ‘faith cometh by hearing and hearing by the Word of God’ (Romans 10:17). Not so in the emerging church. Faith comes by seeing images, touching icons, smelling incense and hearing chants and liturgical recitations.” It comes by personal exercises that focus on self. The Protestant and Catholic worlds see a “spiritual” experience in protecting God’s planet, which might bring collective peace. They have joined the secular world in this enterprise. Declarations on Climate Change, Hate Speech, War & Violence, Income Inequality, Human Rights and Dignity of Women, Standing with Emerging Leaders, and Standing with Indigenous Peoples. Ezekiel’s worshiping “coalition” adopted pagan practices that God abhors. To unify their “worship” experience, that Parliament of Religion’s October “fest” permitted vast iconic forms of worship “to unify” the body – including Wiccans. The church and its priestly functions have bonded with a civic leader. A church–state relationship is suggested. The meaning and very nature of God was hijacked by idolatrous worship of creatures that God, as Creator, had made. Sensory worship with visual representation of gods supplanted His theocratic guidelines. Substitutionary worship came into God’s church. The very ability of Yahweh’s nature to “see” (Deuteronomy 4:28, Psalm 115:4-8, 135:15-18, Isaiah 44:12-29) or care was denied by their worship in darkness. Ezekiel is now taken from a “temple room” to the north gate of apparently what is the entrance to the temple itself (the geography is somewhat uncertain here). There he sees women sitting and weeping for Tammuz. Tammuz was the Phoenician name for the mythological Greek god Adonis. It later became a god of the people of Judah. This was a life-and-death deity, dying each year and later being raised to life. Each year in June to July a festival called “The Tammuz” was held. It was of lamentation by women over his death. It was associated with licentious rites noted for the deepest obscenity, so much so that it is reported that Constantine the Great put an end to this celebration. In the rainy season (winter to spring) Tammuz came back to life. It is a clear desecration of the “state of the dead” understanding with an annual life and death mystery which was eulogized. God’s people should have known better. Vile sexual practices came into the church and became part of its ritualized worship life. The previous picture occurred at the north entrance to the temple. Now the picture changes back to the inner court itself. The imagery is of the “space” between the actual porch of the temple and the altar of burnt offering. This is the most sacred spot, where priests alone could tread (Joel 2:17). Twenty-five men are prostrate, facing east, worshiping the sun. This represents the 24 leaders of the classes of the priests (I Chronicles 24:5, II Chronicles 36:14, Ezra 10:5) plus the high priest. It is noted that they have their back to the temple declaring their rejection of Yahweh in favor of the sun god Shemesh/Shamash. The worship of solar or any astral gods was forbidden (Deuteronomy 4:19, 17:2-5). Nevertheless, this worship gained favor when Manasseh was king (II Kings 21:5). It appears that his son, Josiah, demolished the “horses and chariots” of the sun erected at the entrance to the temple (II Kings 23:5, 22-12). Upon his death, these abominations quickly returned. 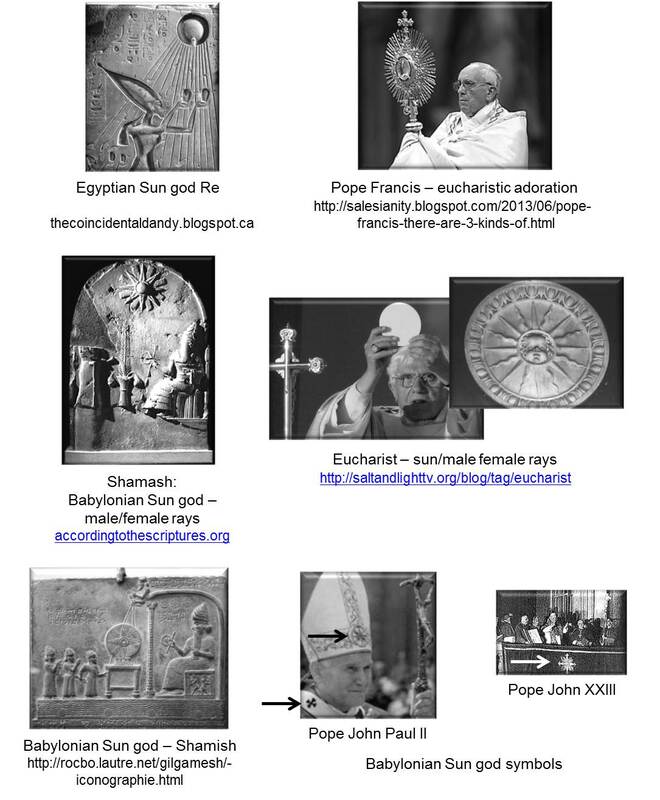 Worship of the sun [not unlike many pagan gods – Egyptian goddess of Re, the god Apis the bull with the sun between its horns, the Canaanite god Baal (sun and storm god) or Shamesh, the Babylonian sun god]. Rejection of God by turning their backs toward the temple – the place of His presence. Apostasy of the spiritual leaders appointed over God’s people. Christ urged the disciples and us to go to Daniel to gain greater insight into end-time prophecy. Specifically, He pointed to the area of the abomination that would result in desolation (Matthew 24:15). “And arms shall stand on his part, and they shall pollute the sanctuary of strength, and shall take away the daily [sacrifice], and they shall place the abomination that maketh desolate” (Daniel 11:31). The word “abomination” is God’s emotional reaction to the “transgression” that leads to desolation. Transgression (be•pesha – H) is one of the worst sins in the Hebrew vernacular. It is rebellion against God’s law, authority and covenant. This is summarized in the seventh-day Sabbath. Paul’s “falling away” eschatological view has deep associations elsewhere in Scripture. Judah received a second chance. In the end of time, the eternal fate of humanity will hang in the balance; God’s mercy will shortly end. 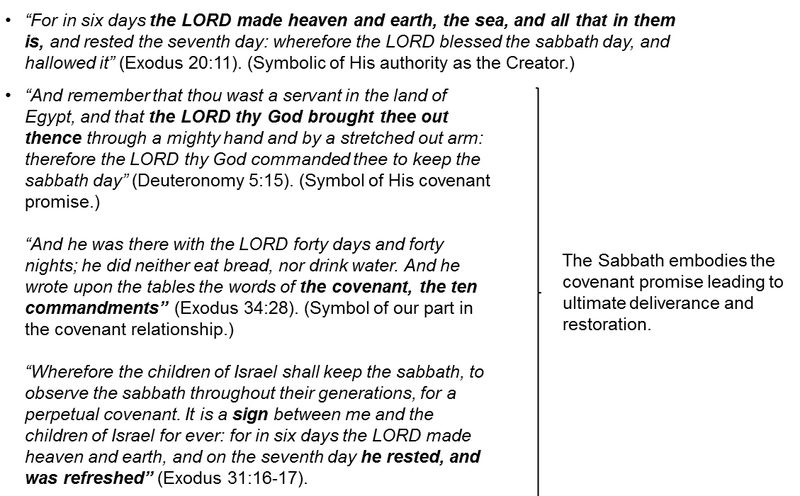 The apostasy at the “time of the end” noted in Daniel 8:17, 19 and chapter 12 relates to rebellion against the Sabbath. That must coalesce with the list portrayed in Ezekiel 8. It contextually will become a key legal issue promoted by the antichrist, the law-less one. Christ urges us to penetrate the deepest meaning of last-day apostasy. The list is broad. Though apostasy can be seen through many “sins” within Scripture, the umbrella of earth’s final evil clusters within the wickedness are portrayed in Ezekiel 8 and Daniel 8 through 12. Beale, Gregory K.; 1–2 Thessalonians, (Intervarsity Press, Academic, Downers Grove, IL – 2003), pp. 199-200. Ibid., op. cit., p. 321. Kurschner, Alan; Antichrist before the Day of the Lord (Eschatos Publishing; Pompton Lakes, NJ; 2013), p. 32, 209. Beale, op. cit., p. 204. Block, Daniel I.; The Book of Ezekiel, Chapters 1–24 (William B. Eerdmans Publishing Company; Grand Rapids, Michigan; 1997), vol. 1, p. 282. White, Ellen G.; Health, Philanthropic, and Medical Missionary Work (1896), p. 50. White, Ellen G.; The Kress Collection (1985), p. 68. Keil, C. F. and F. Delitzsch; Commentary on the Old Testament (Hendrickson Publishers, Peabody, Massachusetts 01961-3473; 2006 – 2nd printing), vol. 9, p. 71. Block, op. cit., p. 291. Oakland, Roger; Faith Undone (Lighthouse Trails Publishing, Silverton, Oregon), p. 85, quoting Thomas Merton in Conjectures of a Guilty Bystander (1989). Block, op. cit., p. 294. Whistleblower Magazine, May 7, 2015. World Net Daily, May 17, 2015. Todd Starnes; May 07, 2015 Fox News. Keil, op. cit., p. 72. Block, op. cit., p. 298.